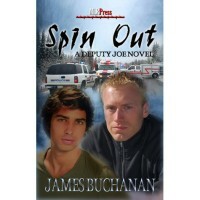 Spin Out is book #2 in the Deputy Joe series. I have read book #1 several months ago and it was like meeting an old friend again - you know, the one you didn't forget but still lost contact with and every quirk, every flaw, every familiar personality trait reminds you why and how much you like him. Joe is learning to do the relationship thing in his honest, stubborn, endearing way and it has been a pleasure to meet him again, watch him stumble and catch himself and grow a bit more.